Small-scale reef building that adds up over time; on my last fishing trip we dropped reef-block number I don't know how many! Have a new load of reef blocks coming Saturday. Will do accounting for next report..
Summer remains summer. Perhaps the fishing is a bit tougher than recent years, but there are good days to be had. Saturday last, for instance, had us down in heavy weather; but when the wind shifted & I tried a different spot - Cbass. Another spot after that - Better! A young lady, Nicole, who's been going fishing with me since the tender age of seven also managed 2 nice tog on clam that day. Caught back to back, they remain the only two tog since early June. When it's your turn for a little luck it pays to have a line in the water. We're still seeing an occasional cod with a rare keeper. Mahi-mahi have shown inshore. We've had a few over 10 pounds. I promise, that's big-game fishing with sea bass gear.. I personally have limited out on flounder several days lately. In early for bad weather Wednesday, I had 3 keepers then too. Clients have been more successful with cbass but are catching some flounder too. You have to work to catch these fluke. They are right in the reef - exactly where the sea bass are. Sometimes they even eat sea bass. Have had fluke to 5 lbs of late. . .
Sunday last we were monitoring artificial reefs. Nick Caloyianis filmed 3 reef sites & a small piece of wreckage last Sunday, July 5th, from aboard my boat, the Morning Star. With 30+ years of underwater film making and living to tell about a bad shark attack, http://www.nickcaloyianis.com is an entertaining website stop..
Incredibly, water clarity was the best I've seen since 1980 or 81. We were able to plainly see reef on the seabed in 40 feet of water. 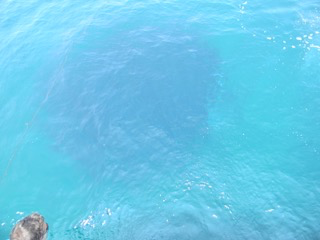 This surface to seafloor shot was at the Shirley Thomasson Memorial Reef. 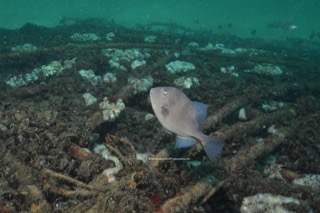 Located at the old Bass Grounds site, the reef is a cable deployment from MD DNR's work before the state dropped their reef program. The fish is a trigger. The white clusters are star coral. The reef was fully & completely covered in sea whip prior to hurricane Sandy. I imagine 40 feet down was a wicked place for that blow.. I also anchored over Capt. Bob Gower's Memorial Reef, a reef we built this spring with several Iron Lady deployments. The reef was completely grown over in shrubby bryozoans with some mussels. There were very few fish. I anticipated catching sub-nine inch male sea bass there, but an 11.5 inch male was quickly caught. We did have a 4.5 inch jv sea bass.. Understanding how to get more eggs fertilized & grown to maturity before turning into dinner is key to fisheries restoration. Nick dove at Doug Ake's Reef too, a spot we built over the last few years. Although visibility was poor, Nick was able to capture images of reef-units local Boy Scouts, lead by Patrick Miller, had built. These were the 8 foot concrete plank units. There were also images from among 2,000-plus reef blocks dropped by the Morning Star on the way out on fishing trips in addition to a 50 foot steel water taxi that once plied Baltimore's Inner Harbor. More pics are at https://www.facebook.com/pages/Ocean-City-Reef-Foundation/143474039155904 Will post the Boy Scout units when we get them. I've gone into it in deep detail many times and have personally handed the last two Undersecretarys of NOAA a detailed thesis. If you measured a sea bass population by the number of eggs available at spawning you'd have the highest number possible for a sea bass population. But we can't do that, everyone knows they need to be fertilized first. The second highest number we can put on a sea bass population then would include fertilized eggs. But that still isn't fair, everyone realizes there's only a small percentage of fertilized eggs that make it through the first few months of life. . .
Mahi-mahi are the poster child for sustainable fisheries. Even the harshest environmental groups grudgingly approve unregulated Pacific mahi harvest because "they begin spawning at 3 to 4 months of age." Here the Safina Center weighs in: "Mahimahi produce many eggs, grow quickly, and reach sexual maturity at a young age making them resilient to fishing pressure." Similarly - when sea bass were asserted to have all spawned by age one, we witnessed an annual doubling of the population despite incredibly higher levels of catch. Back to measuring sea bass populations.. It's obvious that fewer & fewer fish remain as a population ages. When ALL sea bass were spawning by age one, there had to have been a much higher number of spawning fish than today's age 3 & older spawning class. Spawning production is so low today that they're not even able to replace our gravely restricted recreational extractions - our sea bass population is crashing - has crashed. Seems some other folks are starting to catch on to this idea. Believe me - in a world where management, recreational lobbying groups & environmentalists all believe in protecting large female fish as a singularly important method of population restoration; the idea of increasing a population of reef fish by forcing younger fish to spawn via increased fishing pressure is unwelcome. There's hope for my thesis. Where'd they ever get this whacky idea?